Arianna Libenson of Barnstead has been named to the University of Vermont dean’s list for the Fall 2018 semester. Brian Greene, of Center Barnstead has been named to the dean’s list at Becker College for the fall semester. The dean’s list recognizes all full-time students whose term grade point average is 3.50 or higher with no grade below a B- and no incomplete (I) or withdrawal/failing (WF) grades. Brian is pursuing a BS in Exercise Science, Pre-PT Health Science Concentration. 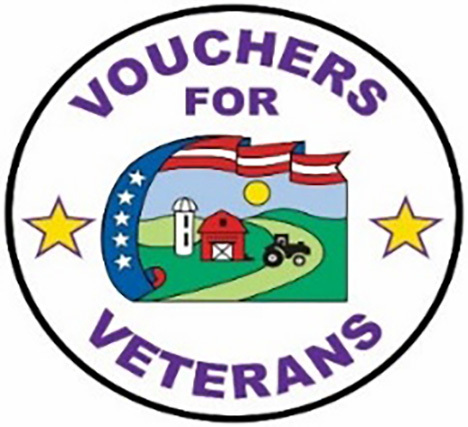 The Barnstead Farmers Market would like to welcome the Vouchers for Veterans program to Belknap County! The BACFM is committed to raising awareness and funds to continue the program and spread it across New Hampshire. Vouchers for Veterans funds vouchers that Veterans use to buy meat and produce directly from growers at local farmers markets. This year, we are pleased to announce, the Barnstead Farmers Market will be offering this program in the month of September 2019 for our Belknap County Veterans! Every week in the month of September, our Veterans will receive $20 a week in vouchers to shop at our Farmers Market! Please join us! On February 8th 2019, the Alton American Legion Family Post 72, the Barnstead Farmers Market and the Aches & Pains Classic Rock Band will be hosting the Vouchers for Veterans Fundraiser and Open Mic Jam from 7:00p.m. to 11:00p.m. The event is located at American Legion, Rte. 28, Alton NH, Phone is 603-875-3461. The American Legion will be serving dinner from 5:00p.m. to 8:00p.m., menu and dinner prices will be listed at www.facebook.com/americanlegionpost72. This event hopes to raise money to support the Belknap County Vouchers for Veterans Program partnering with the BACFM. There will be a Gift Basket and 50/50 Raffle. To donate or contribute to this cause, please email Lori Mahar, President of BACFM at lorimahar@tds.net or call 603-269-2329. Visit the Vouchers for Veterans website to make a secure, tax-deductible donation or send a check, please mark Belknap County in the memo line. All donations are tax exempt and benefit Vouchers for Veterans, and every dollar makes a difference for local veterans. Together, we can make sure Veterans have access to fresh foods and help local growers. Thank you for your support. The Barnstead Farmers Market is inviting the public and all vendors who are interested in participating in the 2019 Farmers Market season, to their Annual Vendor Meeting, February 4th 2019 at 6:00p.m., located at the Maple Street Church, 96 Maple Street, Center Barnstead. The Agenda is the following: 6:00p.m. Intro and overview of the upcoming season, accepting 2019 Applications DEADLINE 2/4/201. Applications are available on the website now. 6:30p.m., What makes a Successful Farmers Market by, UNH, Nada Haddad. 7:00p.m., Vouchers for Veterans program overview by Jeanne Grover, Director. 7:15p.m., EBT overview by NH Food Bank, Brendan Cornwell. 7:30p.m., Increasing your customers: selling and what makes your customers come back by UNH, Nada Haddad. 8:00p.m. Q & A. For more info please visit our website: www.barnsteadfarmersmarket.club or to RSVP: Email: lorimahar@tds.net. The library afterschool club will be meeting monthly every third Friday from 3-4pm, beginning January, 18th. Join us for games, experiments, challenges, art projects, and books. This club is for children in grades 3-6. Please contact Christy at the library with any questions about this program. Join Ann Cwik on Saturday, January 19th at 10:30am at the library to design your own vision board and get one step closer to achieving those New Years’ resolutions! Materials for this workshop will be provided by the library. Join us on Friday, January 25th at 6pm for a Family Reading Fort Night! We will be making forts around the library and using them to snuggle in and enjoy sharing stories. Please bring any sheets or blankets you may have to use as we will have a limited supply available. Light refreshments will also be available. The library will be holding monthly Hygge Saturdays starting with a Felted Soap Workshop on Saturday, January 26th at 11am. Preregistration and a $5.00 materials fee is required. Register at the library or online at oscarfoss.org. I came out to my mail box this morning to find it once again smashed and my mail spread around the ground. The second time this season! With such a small amount of snow, I didn’t expect to see anything other than salt and sand trucks on the roads. I realize that I am granted the convenience of placing my US Postal Service mail box within the boundaries of the roads right of way, and that, even though officially they are USPS property, I’m the guy who has to rectify the situation. Looking across the road I looked right to see my neighbor’s box lying on the ground. Then I looked left and noted that that box was still standing. That one got bladed last season. I banged my good old steel box back into somewhat working order and back onto the post. My neighbor wouldn’t have it so easy, his post was snapped right off. Heading off to work I noted more smashed, trashed or broken off mail boxes along my road. On the way home there were more on an adjoining road to mine. How can there be so much damage happening? Please learn to gauge the extent of your plow blades. Practice out in the woods away from mail boxes, if you need to. Trees will heal themselves. Thank you for all the work you do taking care of the roads, but please, be more considerate of us mail box owners.